The U.S. 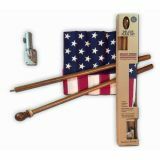 Outdoor Economy Set with Sewn Nylon Flag includes economical hardware with a commercial grade sewn US flag. The flag has beautiful embroidered stars and sewn stripes, white header and brass grommets. In a guarded position such as flying at a low height on the front of a house, this flag will last years. The hardware is economical but serves a residential mounted flag well while keeping the price down. The economical components allow this pole to stay in the class of flag kits suited for giveaway and fundraising. Upgrade: We offer flag kits that include higher caliber components. Generally, the added quality of these components raises the price above fundraising and giveaway budgets. 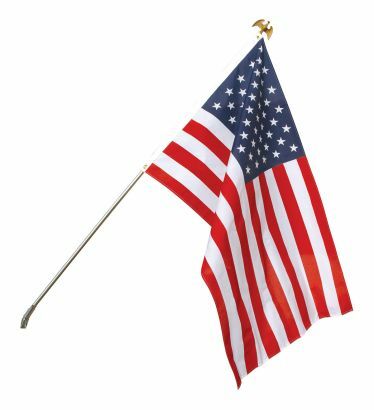 If you would like higher grade kits for your home, please see our U.S. Home Flag Sets section. 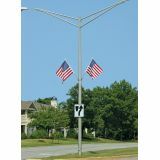 If you are looking for commercial kits to fly on street poles, please visit our Pole Mounted U.S. Flags Section. 3'x5' U.S. Nylon Flag with Embroidered Stars and Sewn Stripes. Finished with white canvas header and brass grommets. 6' Silver Steel, Untapered Pole with a diameter of 3/4"